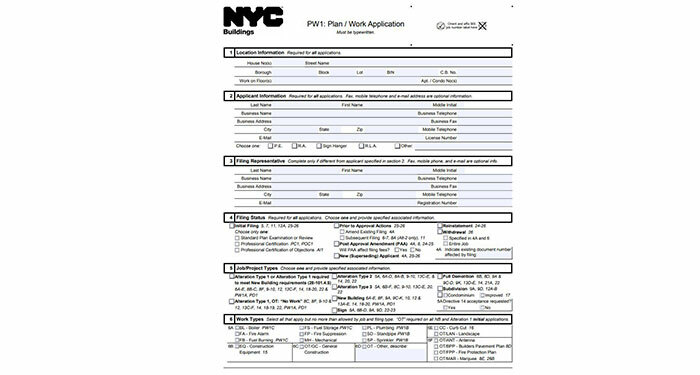 Example of the first page of a PW-1 or Plan/Work Application, which is an application for a DOB construction permit. A Forest Hills woman employed as a Licensed Filing Representative has been arrested on charges of forging the credentials of a Professional Engineer on documents filed with the City Department of Buildings, the Department of Investigation announced on Thursday. According to DOI, the forgeries made it appear that the Professional Engineer prepared the submitted documents, when in fact the Professional Engineer did not authorize the use of his stamp for those documents. Evelyn Dellutri, 55, was arraigned on Thursday on charges of multiple counts of second-degree forgery; second-degree perjury; first-degree offering a false instrument for filing; falsifying business records in the first degree; fifth-degree criminal possession of stolen property; and conspiracy in the fifth-degree. DOI’s probe began on a tip that the defendant was submitting forged documentation to the City. 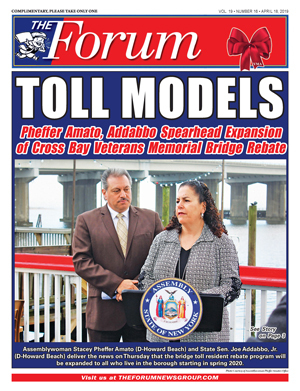 According to the criminal complaint and DOI’s investigation, between November 2014 and August 2015, Dellutri submitted a variety of documents to DOB, which were necessary for construction in Queens, including a PW-1 or Plan/Work Application, which is an application for a DOB construction permit, construction plans submitted as part of that PW-1, and a TR-1, or Technical Report Statement of Responsibility, which are the results of the engineer’s inspection of the completed construction. Approximately 70 of these forged documents were submitted to DOB in connection with commercial construction; and which fraudulently bore the stamp of a Professional Engineer who had not authorized his stamp to be used on those documents. 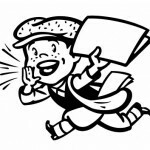 On some of the filings, “Evelsons Consultant, Inc.” is listed as the Professional Engineer’s business name; however, the Professional Engineer stated that he has never done business under that name. DOB records connect Evelsons Consultant, Inc. with Dellutri. The investigation resulted in the recovery of the Professional Engineer’s stamp in Dellutri’s residence. DOI requested that DOB conduct an audit of these jobs and as a result of that audit six Notice of Objections were uncovered raising the following issues: missing items from the drawings; the need for cost estimates for proposed work to be verified; the need for a new Certificate of Occupancy and approved plans; and a sprinkler head did not match the drawings. These projects were put on hold and remain pending. The office of Queens District Attorney Richard Brown is prosecuting the case.